Whether it is an obsession with Robin Hood, old-fashioned hunting techniques or competition, you can feed your passion with archery bedding. We have a wide variety of comforters, custom size duvets, sheets and other bedspreads. These archery bedding designs cover the full gamut of archery themes, styles and settings. Get a classic bullseye with arrows look in the archery bedding design. This layout features the multi-colored bullseye on the right with a beautiful complementary blue sunset with rolling white clouds in the background to the left. Another design offers a completely different look with a black archer silhouette kneeling in the center of a dark orange and white sunset background. For competitive archers who want to relive their glory days, a design called Series of Archery Clear Targets in Green Field bedding design is perfect. Seven targets appear on top of lush green grass, with a majestic view of the ocean and sky in the background. Archery bedding will hit the mark with this design. A much more romantic aura is possible with the “Cupid’s Bow” design. A simple, but angelic archery comforter presents an inviting white background with a golden cupid’s arrow prepped for flight in the center. 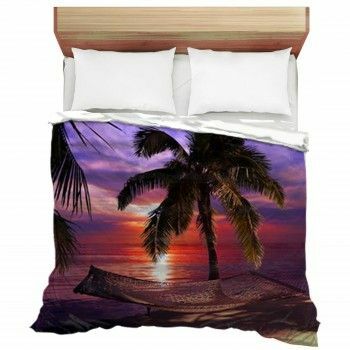 If you need something in blue that matches the ambiance and décor of your bedroom and simple wall mural a bit more closely, we have an archery bedding design for you. Many white arrows on the cover, but they appear with subtlety on a sharp blue dominant backdrop that makes for an amazing archery sheets. Demonstrate your artistic flair with a design in red, purple or blood. This design features painted silhouettes with splashes of paint across the width of the layout, and a darker white backdrop. Need something a little simpler for the kid’s room? Get him a design featuring eight differently-colored arrows that run the horizontal length of your soft archery bedspreads. With so many options to choose from - you will never run out of ideas. Get one or more and enjoy these bedding designs in your bedroom.